It is apple season and our family always has apple picking on our fall agenda. If you do, then you want to check out this post with apple picking tips! However, once you pick those bushels of apples, what do you do with them all – other than eat them? 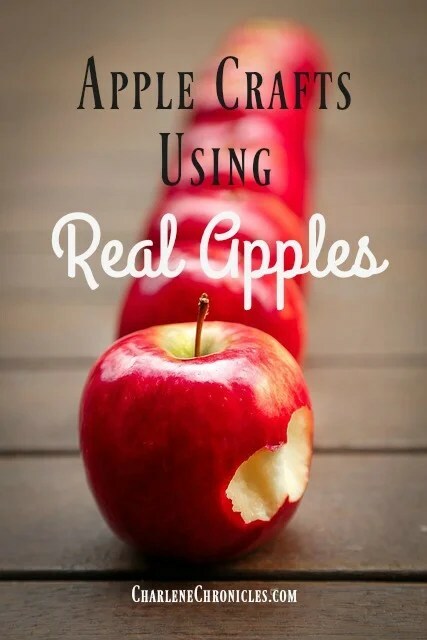 Make various apple crafts using real apples, of course! Inevitability, we get ‘apple-d’ out. Meaning, we eat apples, apple pie, apple strudel, apple jelly, apple crisp, and do not want to consume any more apples! Yet, we still have left over apples. Making apple crafts can be a great way to use those last remaining apples, can be a fun fall playdate activity, or as a nice gift for teachers. The first thing to gather are your supplies. You’ll need paint (red, orange, green, yellow, brown), paper plates, a knife, apples, and paper (or blank canvas bags or frames, or paper bags!) Next, right before your craft session, cut the apples in half. Cut a couple of apples in different ways. Slicing in half from top to bottom gives a different look than cutting the apple through the middle! You can even cut the apples in quarters. Gather the following ingredients: lemon juice, salt, 10 large apples, cinnamon, allspice, cloves, 8″ – 10″ sturdy, heavy gauge wire (for a wreath) and ribbon (for hanging). Want to see more apple related ideas? Check out my post on The Toy Insider with Apple Activities Using Real Apples and my post on fun ways to serve apples to your kids!